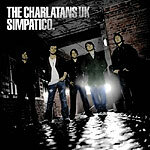 Power pop with aspirations of art rock relevance, The Charlatans can't seem to decide who they are on their latest release. Are they about the songs? Or the attitude? Both? Neither? Listening to "Simpatico" gives one the feeling that the recording sessions must have been a rather confusing time and place to be. The music, anyway, has an air of unrealized expectations about it. At times, the Charlatans UK come close to achieving an artistic unity a la late '70s Kinks. Thick, plush arrangements, swirling rhythms, layered harmonies on vocals  it all starts adding up to something special. For whatever reason, though, the album never quite gets over the hump into the realm of magic. It's frustrating in that all the ingredients seem to be present. The band just can't seem to get those ingredients organized.